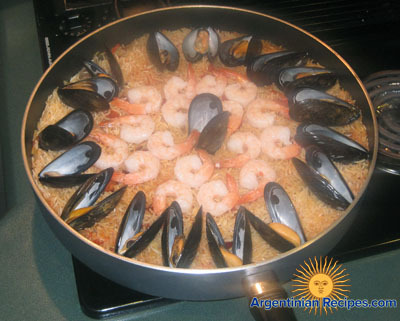 This is the argentine version of the famous hispanic paella, as it is interesting to see another method for preparing this dish from across the Atlantic. The paella is a dish originally from Valencia, Spain, and this name derives from the latin word for pan which is “patella”; to which the french word “poêle” is also related; this is a traditional dish with rice and seafood, all ingredients cooked slowly together. * 1 lb. swordfish or fresh tuna, or chopped fresh cod. 1) Cook the mussels in a little water with salt, previously cleaned and scraped; discard all mussels that did not open. Remove the top shells of half the mussels, and remove the rest completely from their shells. Reserve the broth the mussels cooked into, keeping it warm. 2) Boil about 10 minutes un unsalted water the cleaned and sliced ​squid rings; once cooked, keep warm. Separately, press in one clove of garlic with a garlic press in a little oil in a bowl and add the saffron and finally 1 cup of liquid chicken broth, mix. 3) In a skillet with 1/4 inch oil, fry the onion until translucent, add the chopped tomato, 1 teaspoon pepper, 1 1/2 teaspoon paprika. Mix well and cook a few minutes. 4) Saute the chicken in the pan with oil and when it starts to brown, add the onion with tomato and mix. Add the fish and the squid, add the rice and brown over high heat. Stir and place the ingredients in such a way that the rice is evenly distributed so that it will cook evenly. 5) Add 4 cups of the mussels cooking water and stir. Pour in the preparation with saffron and two teaspoons chicken broth, dissolved in 2 cups of hot water over the rice in all the pan. 6) Lower the heat to low without stirring more, add the mussels, the peas, mussels without shell and place the mussels with shells over the rice, the shrimp between mussels also place marinated peppers in strips, and half the marinade from the can. 7) Sprinkle the pan with parsley and minced garlic; once all the ingredients cook covered, for a few minutes. Turn off the heat and let your paella stand three or four minutes covered the paella pan with a dishtowel and should be moderately dry.